Saints Perpetua and Felicitas were two early third century Christian martyrs. Perpetua was a 22 year old noblewoman and nursing mother, while her companion Felicitas (or Felicity), an expectant mother, was her slave. They suffered at Carthage in the Roman Province of Africa around 203 C.E., together with several other martyrs to the faith. The record of the Passion of St. Perpetua, St. Felicitas, and their Companions is considered one of the great treasures of Christian literature, believed to preserve the actual words of the martyrs and their friends. 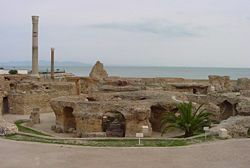 During the persecutions of the Emperor Septimius Severus, five Christian catechumens (candidates for baptism) were arrested for their faith at Carthage. Beside the noblewoman Vivia Perpetua and her slave Felicitas, the group consisted of a slave named Revocatus and two freemen named Saturninus and Secundulus. The five prisoners were soon joined by Saturus, who seems to have been their instructor in the faith who chose to share their punishment. At first they were all kept under strict guard in a private house, where Perpetua wrote her vivid account of the events leading up to their martyrdom. Their sufferings while in prison, the angry attempts of Perpetua's pagan father to induce her to renounce Christianity, the vicissitudes of the martyrs before their execution, and the visions of Saturus and Perpetua in their dungeons were all committed to writing. 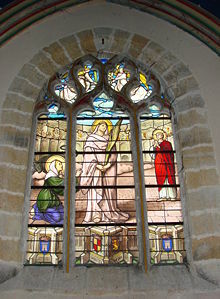 The dramatic martyrdom of the saints is described by a narrator as an eyewitness account. Perpetua and her companions became famous martyrs in later Christian tradition, and her writings were much discussed by the Church Fathers. Recent studies suggest that the martyrs may have been Montanists, members of a "heretical" sect with a strong following in Carthage, but they are universally recognized as orthodox saints. The date of the martyrdom of Perpetua and Felicitas is traditionally given as March 6, 203. (However, some argue that the association of their martyrdom with a birthday festival of the future Emperor Geta would seem to place it after 209, when Geta was made Caesar, though before 211, when he was assassinated.) The details of their martyrdom survive in both Latin and Greek texts. Perpetua's account is generally recognized as historical, making it the earliest surviving text written by a Christian woman. After a brief introduction (chapters i–ii), the narrative and visions of Perpetua (iii–x) are followed by the vision of Saturus (xi–xiii). After this, the account of their deaths, written by an eyewitness, are appended (xiv–xxi). 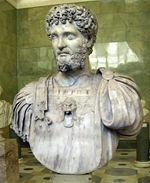 By order of Emperor Septimius Severus (193–211), all imperial subjects were forbidden under severe penalties to become Christians or Jews. The edict did not affect earlier converts, but only recent ones. As a result, the five new Christians and catechumens were seized and cast into prison. Before being led away, the catechumens were baptized. The terrors of Perpetua's imprisonment were increased by her anxiety for her unweaned child, from whom she was initially separated. Two deacons succeeded in gaining admittance to her prison by bribing the jailer, and Perpetua's mother then brought the baby to her. She was permitted to nurse the child and keep it with her. She relates: "Straightway I became well… suddenly the prison was made a palace for me." A vision soon informed her of her approaching martyrdom. Perpetua saw herself treading on a dragon's head and ascending a perilous bronze ladder leading to green meadows, where a flock of sheep was grazing. A few days later Perpetua's father, hearing that the trial of the imprisoned Christians would soon take place, visited their dungeon and besought her not to bring disgrace on their name; but Perpetua remained unshaken in her faith. The next day the trial of the six took place before the procurator Hilarianus. All six resolutely confessed their Christian faith. Perpetua's father, carrying her child in his arms, approached her again and attempted to induce her to apostatize. The procurator also remonstrated with her, but in vain, as she steadfastly refused to offer sacrifice to the gods. The procurator then had the father removed by force. As a result of their confession, the Christians were condemned to be torn by wild beasts. As was the case with many such martyrs, they responded to their sentences by giving thanks to God for sharing in the suffering of Jesus. In another vision, recorded while awaiting her sentence to be executed, Perpetua saw her brother Dinocrates, who had died from a disfiguring disease at the early age of seven, in a place of darkness and distress. She prayed for him and later had a vision of him happy and healthy, his disfigurement only a scar. In another apparition, she saw herself defeating a savage Egyptian, interpreting this that she would have to do battle not merely with wild beasts but with the Devil himself. Her companion Saturus, who also recorded his visions, saw himself and Perpetua transported eastward by four angels to a beautiful garden, where they met in the spirit with four other North African Christians who had suffered martyrdom during the same persecution. Saturus also saw in this vision a certain Bishop Optatus and a priest named Aspasius, who besought the martyrs to arrange a reconciliation between himself and Optatus. Perpetua had another significant vision as well, in which she again saw a ladder leading to heaven. This time, at the bottom of the ladder was a serpent, attacking the Christians who trying to ascend. From this Perpetua knew that her true trial would come from Satan rather than the beasts of the arena. She also gain confidence that her faith would allow her to prevail in this test. Meanwhile, their jailer, Pudens, had come to respect his prisoners. He permitted other Christians to visit them, which may explain how her journal came to be preserved. Perpetua's father was also admitted, and he made yet another fruitless attempt to dissuade his daughter from her impending martyrdom. One of the martyrs, Secundulus, then died in prison. Felicitas, meanwhile, was now eight months pregnant. Since the law forbade the execution of pregnant women and she considered martyrdom to be the greatest honor, she grew apprehensive that she would not be permitted to suffer with the others. However, two days before the games, she gave birth to a daughter, who was adopted by a Christian woman. Felicitas then gratefully accepted her fate. On the day of the games, the five were led into the amphitheater. At the demand of the crowd they were first scourged. The men were then attacked by a boar, a bear, and a leopard, while a wild bull was set upon the women. Wounded by the wild animals, they gave each other the kiss of peace and were then put to the sword. A narrator adds: "But Perpetua, that she might have some taste of pain, was pierced between the bones and shrieked out; and when the swordsman's hand wandered still (for he was a novice), herself set it upon her own neck. Perchance so great a woman could not else have been slain had she not herself so willed it." Their bodies were interred at Carthage. Perpetua’s diary, the first known writing by a Christian woman, was highly respected in the churches of Carthage and was appealed to both by "orthodox" Christians and "heretical" Montanists alike. Indeed, the fact that Montanists were known to prefer martyrdom has lead some recent scholars to suggest that Perpetua and Felicity may have been Montanists themselves. 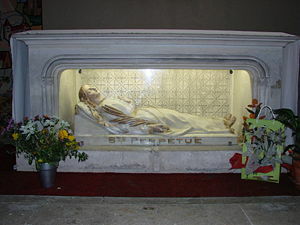 Shrine of St. Perpetua (Church of Notre-Dame of Vierzon, France, nineteenth century. In Carthage, a magnificent basilica was later erected over the tomb of the martyrs, where an ancient inscription bearing the names of Perpetua and Felicitas has been found. In Roman Catholic tradition, Saints Felicitas and Perpetua are two of seven women commemorated by name in the Canon of the Mass. The feast day of Perpetua and Felicitas, March 7, soon came to be celebrated even outside Africa, and by the fourth century these African martyrs were venerated publicly at Rome. Augustine of Hippo (354–430) wrote sermons expanding on the young Saint Perpetua's words. The rose "Felicite et Perpetue"
The account of Saint Perpetua comforting her dead brother Dinocrates also became a point of controversy, as it bolstered the claim that unbaptized infants could attain paradise, or even heaven. Augustine rejected this notion, insisting that Jesus' atoning sacrifice was efficacious only for baptized Christians. He therefore proposed that even though Peretua seems to see the seven-year-old Dinocrates in hell, he could have once been baptized but later estranged from Christ by his pagan father. The story later became an example in the development of the doctrine of purgatory. 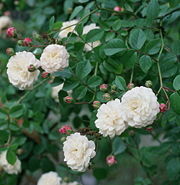 The rambling rose "Félicité et Perpétue" (R. sempervirens, also known as "Old Blush," with palest pink buds opening nearly white, was introduced by Robert Jacques, director of horticulture for King Louis-Philippe, in 1828. ↑ Catholic First, Church Fathers Volume 14 Augustin. Retrieved October 21, 2008. Butler, Rex. The New Prophecy and "New Visions": Evidence of Montanism in the Passion of Saints Perpetua and Felicitas. Washington DC: Catholic University of America Press, 2006. ISBN 0813214556. Maitland, Sara. The Martyrdom of Perpetua. Evesham: Arthur James, 1996. ISBN 0853053529. Nolan, Edward. Cry Out and Write: A Feminine Poetics of Revelation. New York: Continuum, 1994. ISBN 082640684X. Robeck, Cecil. Prophecy in Carthage: Perpetua, Tertullian and Cyprian. Cleveland: Pilgrim Press, 1992. ISBN 0829809244. Salisbury, Joyce. Perpetua's Passion. New York: Routledge, 1997. ISBN 0415918375. Von Franz, Marie-Luise. The Passion of Perpetua: A Psychological Interpretation of Her Visions. Toronto: Inner City Books, 2004. ISBN 1894574117. History of "Perpetua and Felicity"
This page was last modified on 15 April 2015, at 20:04.